The Siege of Fort Stanwix was also called the Battle of Fort Stanwix and the fort was also known at the time as Fort Schuyler. Fort Stanwix, in the western part of the Mohawk River Valley, was then the primary defense point for the Continental Army against British and Indian forces aligned against them. The fort was occupied by Continental Army forces from New York and Massachusetts under the command of Colonel Peter Gansevoort. The besieging force was composed of British regulars, American Loyalists, Hessian soldiers from Hesse-Hanau, and Indians, under the command of British Brigadier General Barry St. Leger and the Iroquois leader Joseph Brant. St. Leger's expedition was a diversion in support of Lieutenant General John Burgoyne's campaign to gain control of the Hudson River Valley to the east. One attempt at relief was thwarted early in the siege when a force of New York militia under Nicholas Herkimer was stopped in the August 6 Battle of Oriskany by a detachment of St. Leger's forces. While that battle did not involve the fort's garrison, some of its occupants sortied and raided the nearly empty Indian and Loyalist camps, which was a blow to the morale of St. Leger's Indian support. The siege was finally broken when American reinforcements, under the command of Major General Benedict Arnold neared, and Arnold used a ruse, with the assistance of Herkimer's relative Hon Yost Schuyler, to convince the besiegers that a much larger force was arriving. This misinformation, combined with the departure of Indian fighters not interested in siege warfare and upset over their losses from the raids, led St. Leger to abandon the effort and retreat. St. Leger's failure to advance on Albany contributed to Burgoyne's surrender following the battles at Saratoga (First and Second). Although St. Leger reached Fort Ticonderoga in late September, he was too late to aid Burgoyne. The first official US flag was flown during battle on August 3, at Fort Schuyler. The Continental Congress adopted the following resolution on June 14, 1777: "Resolved, that the flag of the United States be thirteen stripes, alternate red and white; that the union be thirteen stars, white, on a blue field, representing a new constellation." There was a delay in displaying this flag. The resolution was not signed by the secretary of the Congress until September 3, though it was previously printed in the newspapers. Massachusetts reinforcements to Fort Schuyler brought news of the adoption by Congress of the official flag. Soldiers cut up their shirts to make the white stripes; scarlet material was secured from red flannel petticoats of officers' wives, while material for the blue union was secured from Capt. Abraham Swartwout's blue cloth coat. Armies - American Forces was commanded by Col. Peter Gansevoort and consisted of about 2,400 Soldiers. British Forces was commanded by Lt Col. Barry St. Leger and consisted of about 1,600 Soldiers. Casualties - American casualties were estimated to be 12 killed, 23 wounded, and 9 missing. British casualties were unknown. Outcome - The result of the battle was an American victory. The battle was part of the Saratoga Campaign 1777. In April, Major General Philip Schuyler ordered the 3rd New York Regiment, under the command of Col. Peter Gansevoort, to occupy and rehabilitate the fort as a defense against British and Native incursions from Quebec. Arriving in May, they immediately began working on the fort's defenses. Although the Americans officially renamed the fort to Fort Schuyler, it was still widely known by its original name. 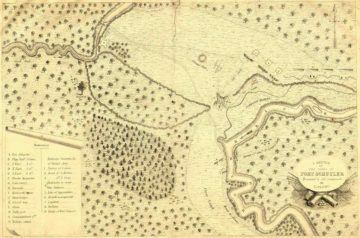 Warnings from the friendly Oneida Indians that the British were planning an expedition to the Mohawk Valley were confirmed by mid-July, spurring the pace of the work. In early July, Gansevoort reported on the state of affairs to Schuyler, noting that provisions and ammunition were in short supply. Schuyler ordered additional supplies sent to the fort on July 8. St. Leger, who was brevetted a brigadier general for the expedition, assembled a diverse force consisting of British regulars, a number of artillerymen, 80 jäger, 350 Loyalists from the King's Royal Regiment of New York, a company of Butler's Rangers, and about 100 Canadien laborers. His artillery consisted of two 6lb. pieces, two 3lb., and four small mortars. He expected these to be adequate for the taking of a dilapidated fort with about 60 defenders, which was the latest intelligence he had when the expedition left Lachine, near Montreal, on June 23. St. Leger first learned that the Americans had occupied Fort Stanwix in force when prisoners captured from its garrison were brought to him on the St. Lawrence. He learned from the prisoners that it had been repaired and was "garrisoned by upwards of 600 men ... and the rebels are expecting us, and are acquainted with our strength and route". Daniel Claus, the Indian agent accompanying the expedition, convinced St. Leger to go to Oswego, where a body of Indians could be recruited. On July 14, they arrived at Oswego, New York, where Joseph Brant and about 800 Indians joined the expedition. These consisted mainly of Mohawks and Senecas, but there were also warriors from the other tribes of the Iroquois League (other than the Oneidas and the Tuscaroras, who still claimed neutrality), and some Indians from the Great Lakes area. After leaving Oswego another report reached St. Leger that more supplies were en route to the fort. The movement of his main force up Wood Creek from their landing on the eastern shore of Lake Oneida had been blocked by the American defenders just a week earlier by felling trees across the creek; St. Leger's forces were rebuilding an old military road to reach Fort Stanwix. St. Leger immediately dispatched Brant with 200 Indians and 30 regulars to intercept those supplies. On August 2, Brant's arrival at the fort but it was too late.The supply convoy, which was guarded by 200 men from the 9th Massachusetts Regiment, had arrived and been unloaded. Brant's men were able to capture the convoy's boat captain; the Massachusetts men remained in the fort. On August 3, St. Leger's main force arrived, although the artillery did not arrive for several more days. On August 3, St. Leger, coming from Niagara, laid siege to Fort Stanwix with a force of 800 British troops and more than 1,000 Indians. About 75 miles downstream, militia commander General Nicholas Herkimer received word of the British attack. He assembled a force of 800 men and boys from Mohawk River Valley settlements and farms and marched westward to relieve the fort. The British, having learned of Herkimer's advance, prepared an ambush along the river at Oriskany, 5 miles to the east. The resulting conflict, on a man-to-man basis, is considered the bloodiest battle of the Revolutionary War. When the guns went silent, St. Leger's force was badly mauled, most of his Indians were either dead or had deserted. Herkimer's bloodied band returned to their homes; where the general died of wounds 11 days later. On August 22, 19 days from the start of the siege, the British retreated westward, allowing Fort Stanwix to become the only bastion in the United States that did not fall to the British at some point in the war. The fort's successful stand denied St. Leger an opportunity to rendezvous with other forces and played a major role in denying crucial reinforcements to the army of Burgoyne in the pivotal Battle of Saratoga a few weeks later. On August 23, Arnold, whose force was augmented by the arrival of friendly Indians, advanced about 10 miles toward Fort Stanwix when a messenger from Gansevoort notified him of St. Leger's departure. Pushing on, they reached the fort that evening. On August 24, Arnold detached 500 men to pursue St. Leger early that day, whose column was also being taunted and harassed by his formerly supportive Indian allies. An advance party reached the shores of Oneida Lake in heavy rain just as the last of St. Leger's boats were departing. 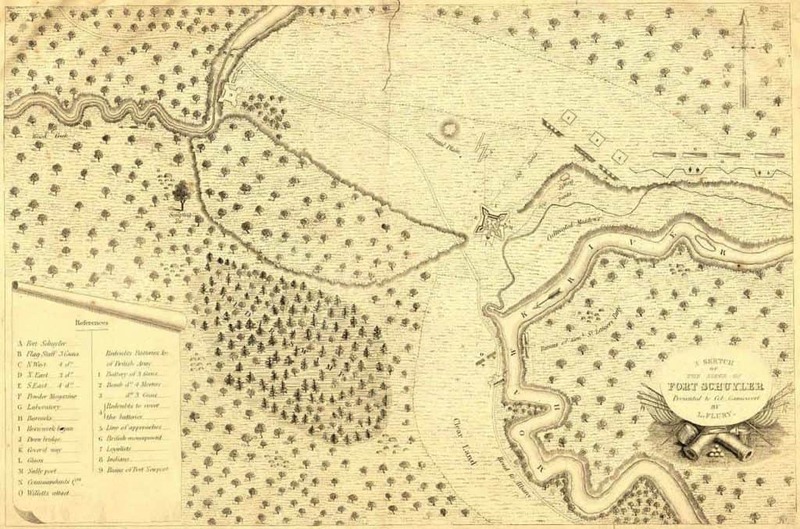 Leaving a garrison at the fort, with smaller outposts along the Mohawk, Arnold then hurried back with about 1,200 men to rejoin the main army. While still on Oneida Lake, St. Leger learned from an Indian messenger of the true state of Arnold's force. On August 27, St. Leger wrote to Burgoyne from Oswego that he intended to join him by traveling via Lake Champlain. He reached Fort Ticonderoga on September 29, too late to assist Burgoyne. Burgoyne blamed the failure of his campaign in part on St. Leger's failure to penetrate the Mohawk valley, and the lack of sufficient Loyalist support. He believed that a well-placed Loyalist uprising in upstate New York would have diverted enough American resources that either his advance or St. Leger's would have succeeded. Burgoyne was also hopeful that St. Leger's arrival at Ticonderoga would be sufficient to assist in his retreat. However, he was already surrounded by the time St. Leger arrived at Ticonderoga. In an analysis after the surrender, Burgoyne noted that the failure of General William Howe to support him made it possible for Gen. Washington to divert resources from the area around New York City to assist both in the relief of Fort Stanwix and at Saratoga.